Even though the wind is still breezy and cold specially at night, I know that summer is coming soon. In extreme weathers either by heat or cold, our skin suffers from it. It becomes too dry or too oily. This can be avoided with Esfolio's Rich Coconut Skincare Line! The entire skincare set is complete from toner, essence, moisturizers, and eye creams. What more could you ask for? There is something about Coconut that it is always good for the body. Do you know that doctors uses Virgin Coconut Oil to include on preterm's diet? Because it there is a study that said it helps in prevention of developing sepsis for infants. Not only that, most hair products that are effective contains coconut as the main ingredient. Even on body care like lotions and scrubs. So why not try it on your skincare routine, right? 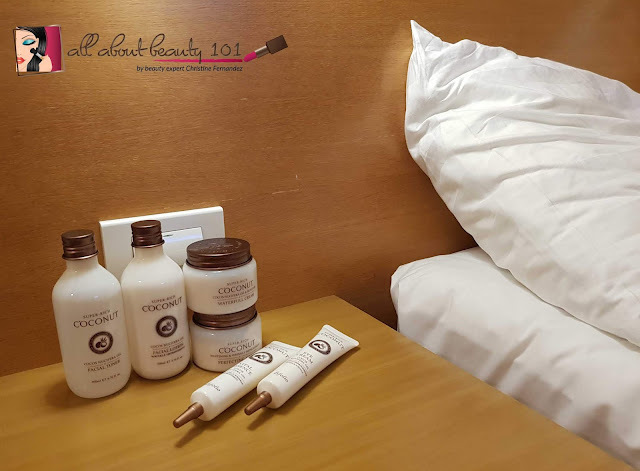 There are six products in Esfolio's Rich Coconut Skincare Set. All designed to brighten, moisturize and help manage sun damage to the skin. After washing your face both day and night, you can use their Facial Toner first. Are you familiar with Shiseido's softener products? 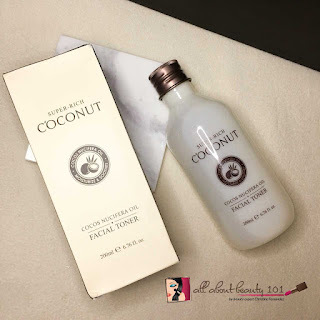 If yes, you will be delighted to learn that this Esfolio Rich Coconut Toner is like softener. It is gentle and it does not have a stingy feel to the skin as well as the strong odor of the usual toners. This toner contains hyaluronic acid that retains and balances the moisture of the skin. It is also known to help in preventing wrinkles to the skin. Since it is like a water-based formula, you can use a cotton pad or just simply use your fingers in applying it. Of course, after the additional cleansing of your skin with the toner. The next step is to use an essence. Esfolio's Vibrant Essence helps in the absorption of anything that you apply after it. It contains Hyaluronic Acid and Niacinamide that helps in controlling the hydration of the skin as well as brightening the skin. The next step is application of Facial Lotion. It is like a moisturizer but creamier. I usually have a dry to combination skin but sometimes I find that this is too creamy for my skin. It takes time to be fully absorbed. But my skin feels soft after it was fully absorbed. 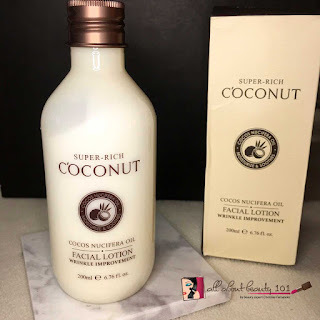 If you have a really dry skin, I suggest that you try this first if it will help in hydrating your skin, this is too creamy like I am sure it can help in boosting the moisture. For the next step, apply a moisturizer over the facial lotion. 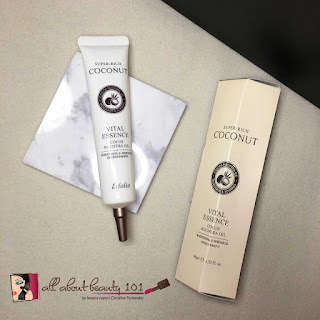 There are two types of moisturizers released by Esfolio for this Rich Coconut Skincare Set. The first variant is the Waterfull Cream. The Waterfull Cream is creamier compared to the other variant of this product line. It is designed to smoothen and soften the skin at the same time retaining the moisture. This one is like the Facial Lotion - too creamy. But as tested, it was able to hydrate my skin well and it takes time before it can be fully absorbed. I use this on nights that I feel that I need a boost for hydrating my skin specially if I used a matte foundation all day long. 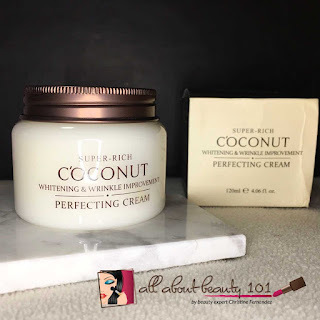 The other variant is the Perfecting Cream. If the other variant is to soften and smoothen the skin, this other variant is to whiten and prevent wrinkles of your skin. I do not know if it is only me but I find this is less creamier than the Waterfull Cream. I love using this because I can feel that my skin tightens with each use. Specially the next morning after washing my face, my skin looks more fresh and plump. To give more boost to the whole skincare routine, add an eye cream to give more love to your skin. The eye cream is creamy too. 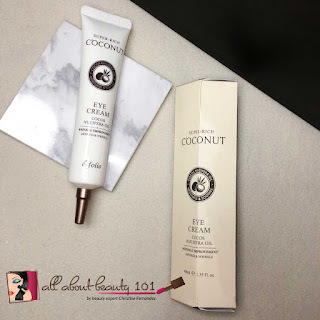 I find that this eye cream can moisturize the area under my eyes! It did not diminish the size of my eye bags but it helped a little in lightening the dark circles under it. This entire set is almost complete for the 10 Step Korean Skincare! You should definitely try it because it is gentle to the skin, effective in hydration, affordable, and beneficial to the skin. Just to share, my personal favorites are the toner, eye cream, and Perfecting Cream. Where can you get it? It is available at Esfolio's website and stores. Also available at BeautyMNL.